The National Sports Collectors Convention is right around the corner, so we know you all have been waiting with anticipation. As is our time honored tradition, the National brings with it a COMC Promotion, generally one with a repeating number theme. This year is no exception. There is no need to wait any longer. Now that the details have all been hammered out, we’re ready to share them with you! We wanted to do something special for all of the people who use our site – our buyers and sellers. We’ve found that one great way to make buyers happy is to provide the best selection of items. And one great way to make sellers happy is to provide them with happy buyers. So this year we’re trying something new. At the National we are going to be handing out coupons with scratch tickets with prizes ranging from $3 off shipping, to $5 or $10 of COMC store credit. Some coupons will even have a secret multiplier to add even more credit to the account when redeemed. For those who can’t make it to the National, don’t worry because we will be adding these coupons to the first 10,000 packages we ship out starting August 1st. And to make sure that buyers have the best selection of cards to choose from, we’re offering a National Processing Special. Instead of dropping out the floor of our Basic processing service, we’re offering a service to help get better cards up sooner. 3 Week, 300 ct box, 30¢ per card. If you don’t have a 300 count box, measure out a single row of cards that’s 5 inches long. The special will start on July 17th. Orders mailed in must be postmarked by August 31st. Use the Submission Wizard to notify us of the submission. Limit ONE 300 count box per person. Single row, no jammed in minis, nothing in the sides or laid on top. These cards will be processed with a 3 week due date. Items sent in using the National Special will not be subject to the $0.50 Item Upgrade fees for pricing a card over $50. There will be a $3 minimum charge for the National Special. This will be charged if you send ten or fewer cards. Packages that are sent in for the National Special, but do not meet these guidelines, will be processed at our Basic service level. For those of you who will be in Chicago for the National, you can drop your cards off at the COMC Booth to avoid any of those extra shipping costs. We’ll be booth 648. Our friends in Canada can also take advantage of this special by sending their submissions to our office in Burnaby. We have updated the following information in the post above. You can start submitting items for the National Special – the submission wizard has been updated. There is a minimum batch size of 10 cards for the National Special. Batches of 10 or fewer cards will be charged $3. We have clarified that items submitted with the National Special will not have the $0.50 item upgrade if priced above $50. This entry was posted in card shows, specials, The National, Uncategorized. Bookmark the permalink. This year’s deal is definitely not very exciting compared to prior years. Offering more than 1 300 box per account would help. So if I send in 1000 cards for basic service but not the 300 card “special deal” and you receive them say before the 29th, will you make sure to honor the 3 weeks due date for this special deal and set my unfinished cards aside and rush them through on the last day or days of basic service like the times before, even though you receive mine before the “special deal” cards? I have been told for the past few months or so that the average completion for the basic service is “about” 35 days but the last batch you received in March, 305 of the 600 cards were complete and the rest were completed on the very last due day June 20th, as were the previous two batches completed on the last day. My point is the average completion days were no where near the average that I was quoted in May and I fear with this new “special deal” any basic card batches will fall short of the “average” more severely. I hope the new hiring in May for your processing department is now able to fulfill the 35 day average or better to deposit after the batch is started. And I believe you should clarify COMC policy of selecting “New” or “In season” cards from the new batches you receive. I contend that the seller should have the say so in what he/she decides is priority and not COMC employees, especially newbie processors. This is pertinent information the entire COMC “nation” should understand completely because I could not explain that part properly to two collectors that were interested in COMC. I agree with you Ken i sent in 300 cards my due date is July 27th and so far 95 of my cards are on and the others are still being processed. I am tired of hearing about the deals from other dealers who send in cards all the time who get there cards on the site faster. Which i have addressed to them and they denied it which is a complete lie. I am to the point i am about to stop sending in cards to them cause of this. NOW YOU KNOW THE REASON WHY YOUR CARDS AREN’T BEING PROCESSED IN TIME. Although the past year or so has been troublesome with a few issues regarding the problems on the site, I am troubled that the accusation of a “complete lie” was put forward about COMC. I am not sure what exactly you are talking about Jason but any issue I have had with Moe, Nathan or Norbert may have been unclear to me and I didn’t quite understand what their response was but never did I believe anyone at COMC would intentionally lie about anything. They have experienced many difficulties since the Beckett debacle and patience was thin at times but never to the point, in my opinion, to lie about an issue. Again, I do not know what the exact issue you are talking about but if it can be worked out with you and COMC I would hope a lesser accusation or explanation would be presented. Having said that in all fairness to COMC, and having been a business person for the past 45 years I brought up a few ideas COMC put forth that were not well thought out, IMHO, and tried to add my two cents but never did I experience the character trait in anyone that would intentionally lie. The most confusing policy to me and is unfair to sellers is for COMC to decide what is “New” and “In season” as far as what gets processed first. Does COMC have a person(s) go through a batch of 1000 cards and make that determination? That would be a very misguided use of processors time and explain why average times of 35 days is a pipe dream. 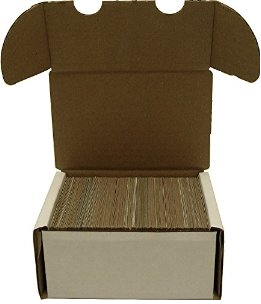 Now everyone think for a moment – you sent in 1000 baseball cards a few weeks before baseball season started and separated 100 rookie cards of Mike Trout because you believed his rc would be still in great demand (which was and still is), and you added the note to “process Mike Trout first”. But one of the processors or whoever determines “New” or “In season” likes the chances of another player being the hot cards to buy. This to me is completely ill-advised because the seller and the seller alone should determine his selling strategy and no one else. I am still waiting for Tim to address this policy decision. I know they’ve spoken before of “new” and “in season.” My personal experience is as follows: When I send a shipment that comprises dozens of different sets, it takes longer for things to be added to the site. (Insert sets count as separate sets.) Let’s say I bought out a collection, and it had 5 complete sets of 1995 Fleer. Those get added to the site in about 3 weeks. I do believe there is a premium to submitting new and in season stuff, but I think there is accidentally a higher premium to “concentrated” submissions. I don’t mean putting the cards in numerical order because it doesn’t really make a difference to them, it seems. But, sending in shipments from just a handful of sets seems to get them processed more quickly. It’s kind of hard to make any decisions based on that, though, because whatever you have is what you have. My main concern is the seller should determine what is processed with priority in their batch. My other concern, and I would like an answer from COMC, is who exactly is doing the determination. An honest answer would be appreciated and expected as this is a legitimate question relating to the their property and potential income of sellers. So, does this part “Items sent in using the National Special will not be subject to Item Upgrade fees. ” mean that I can send in items which will be priced realistically for $50+ and not have to pay the 0.50 extra fee or is it for something else. What about slabbed or super thick or booklets do they fall into the same category? I’m not overwhelmed with this 300 card deal as the past years were much much better. I’ve been sitting on cards for nearly a year and it will be way more than 300 I want to send in. I was hoping for a good processing deal where we could get them down into the 0.20 and under range like in the past. But I guess this is the future. Please at least comment on what no upgrade fee’s actually includes. I want to make sure I have the right stuff sent in. You are correct in that you can send in itmes which can be priced over $50 and not have the $0.50 item upgrade fee charged. You can also send in slabbed, thick, or booklet cards as long as they fit inside of the 300 count box. Thank for the reply Nathan. At least that can be more of an incentive for using this promo as opposed to basic processing and getting hit with 0.25 and then 0.50. I’m pretty sure slabbed cards won’t fit the boxes but I just wanted to get clearification on the waive of upgrade fees and what it entailed. C’mon guys. Last year the special was a 700 count box processed at the standard timeframe for $77.77. I fit over 400 cards in that box. This year, if I fit 225 cards in a 300 count box, it will cost me 67.50. I understand you are trying to get more “upscale” cards on the site, but this is ridiculous. This is a once a year special that we sellers wait for. I have set aside around 700 cards for this years special. I was anticipating something allong the lines of an 800 count box for $88.88. I cannot justify spending the money for this years special, just to get a handful of cards listed a few weeks earlier than the standard processing. I guess i’ll have to skip the special and go the standard route. Disappointed. At least get the info right,last year it was a 550 count box for $77.So they basically doubled the the price for this year’s not so special,special. I would have been OK with 550 for $88. Ken what im saying is Tim and Steve have there favorite’s of who’s cards get on the site faster based on how much volume of business they bring to COMC and value of cards. Which is the more cards,book value and money you spend the better you are. for example eaglescards and cccardfactory was sending in 5000+ cards at a time and they were getting there cards on alot faster then if we were to send that many cards in, which isn’t fair at all. I know which guys are getting the deals and when i said something to Norbert he denied it and tried to tell me that they don’t know who cards are being worked on or added to the site. They have to know who cards they are working on. All they have to do is open there package and then place it in the front of the line for them to work on them. I have been selling sports cards for 30 years and have an inventory of 28 million cards. No special here…. oh well. As more of these accusations and theories are made known it seems there will have to be some sort of accountability sometime, and sooner than later. You evidently are privy to some facts and figures that, in my opinion, are inside information. I, and I would imagine the entire clientele, would be interested in knowing what you know as fact. And the more folks that get into this conversation, maybe and hopefully we will know exactly, if anybody, is getting preferential treatment. I hope this doesn’t become like a political thing such as we have today in our country. Folks not really having or understanding facts but siding with emotional favorites. I have had suspicions also but I could not back it with facts, only questionable policies initiated that made little business sense to me. Hopefully others will join in on this discussion, including COMC management, because rumors have ruined many a business endeavor. If questions are raised and there is nothing to hide, a reasonable and honest answer can put to sleep suspicions. But if there is no attempt from COMC to answer in a closed forum of members of the “COMC Nation”, there may be reason to believe mistakes were made. If there are problem areas of suspicion and there is no attempt to address them, no matter how far out they seem, then I would conclude cover up and not knowing how to address it or just plain arrogance. Well Ken you remember seeing Swagcards with $2 million worth of book value on here within 3 months of signing up, for someone to add that kind of volume that fast it would cost alot of money so really how long did it take to get that many cards on 30 days ? How many of us had are processing due dates not done in time for this to happen? How many of us got the same treatment ?, Anyways i don’t even think it would be worth spending that much to add them when Beckett has some good deals to add cards on there site and cross them over to Ebay then you get more exposure and sales for your money. As for COMC to address this issue if they did they would deny giving preferential treatment to a few of there big dealers who sent it a lot of cards. No Buymore you do the work and add your cards to Beckett using there data base and then can list them on to Ebay in a few clicks.saves alot of time. packages start at $99 a month. you can list your whole inventory on Beckett Marketplace, they have limits on each package of how many cards you can list on Ebay i think it goes as high as 1 million cards but that package is alot of money. I look up Swagcards and don’t see the figures you are talking about. Unless figures were altered Swagcards only has sales of $10.00 and 40 cards for sale. Let me know what you find out because something here doesn’t jive….thanks. I think swagcards was the first large account on COMC. All I would say about favoritism is that those who send in the most cards get the most cards added to the site. It’s just math. Now, if people are saying a disproportionate amount of some sellers’ submissions are being added to the site early because of who they are, I would disagree. But how could you ever know? I think anyone with a large submission is going to be more likely to have enough cards from a particular set to cross whatever threshold is required to get them added to the site. That being said, I will have cards from the same set added over several days, so I can’t say I know for sure how it works either. They could take longer with my cards if they wanted. They’re mostly low-demand compared with what a lot of you send in. And I have 20,000 cards waiting to be priced because it’s so much easier to send cards in than it is to price them 🙂 My problem. It wouldn’t hurt to get a refresher from COMC about how they process cards. They don’t have to say anything new, just confirm that the method they switched to is still in effect. As someone who was on Beckett for 8+ years I would not recommend it to anyone unless you like horrible customer service, a site that is down frequently and management that bends over and grabs ankles for their biggest “dog” That is what you get for $250 a month…. I can understand why upper management, at the top, will not want to engage. But he/they brought many problems on themselves with ill-advised policy. One being having employees or anyone connected with company decisions or policy buying/selling on their site. That decision, immediately, is a time bomb concerning issues of preferential treatment whether real or imagined…liken it to inside traders. This has been brought up directly to management but never addressed. Having said that, it is not Nathan or Norbert that should be given a hard time as they, I believe, are in the position of handling problems the best way they are allowed to. And any time I’ve had issues, both Nathan and Norbert, as well as Moe before he left suddenly, have handled them with class and professionalism, which was amazing considering the plethora of issues they had to answer and try to deal with. Maybe the best solution to any question or suggestions we have is to air them on this blog and we as the source of income for COMC can discuss and air out any issues we have. I am persuaded some complaints will be unfounded and some will need immediate attention from Tim himself to individuals off this forum if he has the time. The overall concept of COMC is great and I hope it grows as I , as well as many clients have much time and money invested here. But there is the possibility of folks leaving because of issues and policy not understood or confusing. Word of mouth is what will grow this site. One good recommendation will bring another to the site but one bad rap can spread like wildfire. Thoughts from an average collector and recent consignor – I’ve got to second the thoughts of Joelshitshow. I’m very excited about the scratch off cards and the additional marketing revenue, ie, additional sales for all of us while expanding our customer base. My experience with batches being processed was acceptable. The cards tended to be processed in spurts and some were processed on the basic service due date, but I got what I paid for as advertised. I’m disappointed I won’t be able to stop by in Chicago… all the best COMC nation. Unfortunately, you are paying for a service (up to 8 weeks) that was expressed as temporary because of marketplace turbulence. The service that was prior to the now standard service was 4 week processing for .25. You are right that the scratch offs are good, but….many of us have weathered a long storm and stood with Tim, Julia and the rest of the COMC Nation to no longer be given the service we have come to love. I have accepted it and stopped expecting that it will ever be what it was and just enjoy the cards for the cards. You sir have a commendable character trait I used to have twenty years ago but now because I’m getting to be a grouchy old fart and flash at the sound of any type of diversion or cover up, my patience runs thin. For you to say you have accepted it probably takes the edge off many of the disappointments we have experienced since the Beckett miscalculation or understanding which is a good thing for you. I don’t know what the fate is for COMC but I have believed for many months now that Tim has tried to do too much without proper in depth and complicated business guidance or business experience. Whether it is stubbornness, a vendetta against Beckett or a combination of various issues puzzles me. Whatever it was, I thought Tim ventured into various off shoots within COMC that, as you said, resulted in the service we loved gone and to me became increasingly a worry that the house that Tim built was falling. I have no choice, with all the time spent trying to help fix problems with the site and being the “canary in the coal mine” as Norbert once put it, (which I appreciated coming from him as I felt my efforts were helpful) to hang in there because many hundreds of dollars have been spent adding to the site. I don’t know what surprises Tim has in store for the future but I sincerely hope any new ideas are well thought out from now on and they do not cause problems with those of us who are hoping for a problem free exchange where the customer’s best interests are number one priority above anything else. But I will try to use your approach and just enjoy the cards for the cards……hopefully : ). Have a great evening! All these tiers, levels, upgrades, varied processing times,specials etc. is too complicated to bother with…What’s wrong with one price, first come first served?? Ken it was before COMC made the change . There were a few questions about how processing works that are addressed below. Instead of of processing every single card in a submission one by one before it is ready to be deposited, as we have in the past, we have been using a different model for over a year and a half.This has enabled us to get cards into users accounts as soon as they are ready to list, as well as to allow us work more efficiently. The way the concept was described is as follows. The analogy is being at a card show with different tables of cards from different sellers. The improvement would be similar to having one person focus on baseball cards, a second on football, and a third on tennis. This allows for focused processing of a type of cards instead of being pulled in several different directions at once. Please note that this is just an explanation of the concept behind what we are doing. With this model, new and vintage cards are prioritized. As are cards of sports that are in season. Cards are also processed to make sure they hit their stated deadlines of up to 8 weeks for Standard, up to 2 weeks for Select and Mailbox, and up to 3 business days for Premium. That’s a complete lie i sent in a bunch of cards from new products that released and it took 2 months for them to get on the site. When i asked Norbert why it took so long to get on the site, The excuse COMC told me was we don’t have a catalog for those cards yet so they sat there for 2 months and i broke even on them. So now i don’t send them in. Here is another issue i have now i sent in 300 cards 225 of the cards weren’t even on the site my due date is July 27th as of 7/17/15 208 cards still remain being processed, you would think with 225 not even on the site ever they would want to get them on ASAP. Under that system, those who are not sending in vintage or in current season items should not be charged the same since their items are going to be kicked to the back of the line when it comes to processing times. I heard the same thing about Tony E.
Too cute to have two “names” attacking me…. I do not think they give special treatment to bigger sellers as a friend of mine who is a top 10 seller told me they would not give him a discount if he sent in 75k cards…But they should, I have 2 businesses and I definitely give breaks and discounts to my bigger customers and i have no problem if the little guy knows, that is just good profitable business. If you do not like being a little guy then be a big guy. I guarantee that I don’t get special treatment. And I don’t want it. The agility of the smaller sellers is what keeps the site going. Lee, this is not about monetary discounts but if COMC wants to give discounts that is their business but not a very wise one. They will get the standard price eventually if the seller wants the cards listed. Discounts may be policy in other types of businesses but not with COMC. The question here is preferential treatment and a policy that gives certain cards/dealers a pass to the front of the line and COMC deciding when a seller’s cards will be processed. It should be the sellers and only the sellers deciding when their property is processed. Now someone with only “new” (whatever that entails) or vintage cards (which is a new addition since I checked with COMC recently) will be processed first. And in season??? I planned a hockey batch to coincide with the Stanley Cup Playoffs – about 600 cards – sent in March. Well, someone at COMC decided the Stanley Cup Playoffs were not part of hockey season evidently, consequently only 133 of those cards (most were autos, rcs and patch/jersey cards) were processed and available to sell on May 19th, and only 240 of the estimated 600 were processed by June 4th, by that time it was one day past the first game of the finals. And this is only one example and others may have the same thing happen but not even realize it. As everyone can see by these facts, a different approach to processing our cards has to be initiated and not changed when income needs to be generated by COMC. There has to be a fair system in place where a subscriber, and I don’t care if he/she is a twelve year old “little guy” who just spent his $5 from his/her paper route on a pack of cards and got a chance to make a profit or a “big guy” who gets preferential treatment because he/she has 1000 vintage cards to sell. You see some folks just can’t magically become a “big guy”. This is supposed to be a fun hobby for some and a business for some…..it’s not supposed to be all about the Benjamins. You want nothing but “big guys” on this site keep discouraging the young collector and you will have a bunch of “big guys” using COMC for a warehouse. We do not have a discount or preferential treatment that is applied to certain users. People quite frequently ask if they can get a discount for number of cards, or for some other reason, and I consistently point people back to the processing services that we have listed on the site. This is how processing works. Items are processed with the first prioritization giving to the batches due date. A batch that is due today will always have priority over a batch that is due tomorrow. Cards are also prioritized based on being new or vintage. I know you have a sticking point with prioritization based on what is in season. But please understand that this is the order in which items are prioritized. In the instance of the hockey cards that were processed, although in season, not as fast as you would have liked, this is not because we have prioritized someone else because they are a “big guy”, but because someone else due date was sooner. We continue to work to make processing faster and more efficient. As I read through these posts, I have to ask a question. Nathan, or anyone within the Customer Service team, can you let me know how the National Special cards will be processed in relation to those cards that have already been submitted. IE…I have a batch awaiting processing. Will the priority now be given to those cards submitted as part of the National or will my cards still be treated with fairness? I have had decent success with cards going live throughout the 8-week processing time and fear that now-I wont see these until the very last moment. I believe this to be a legitimate concern? Items that are submitted during for the National Special are being treated much the same as the Select service, but with a 3 week instead of a 2 week deadline, and no item upgrade charges. Specials aside, I would sure love to see the auction feature that was tested months ago being implemented. As a buyer, I know there is money out there waiting to be spent. I can only hope some of the sellers with relatively obscure yet obscenely over-priced cards throw them out on the auction floor so I can hit some of my needs. Nathan, was the plug pulled on this blog? The plug wasn’t pulled, but with a few users arguing, and the weekend coming up, I didn’t want it to turn into an unmoderated fight over the weekend. I’ve approved several comments today, and will approve more when I have the chance to respond tomorrow. When do I make my ship[pment request to hev the best opportunity to get on of the 10,000 scratch tickets a.k.a. July 30, July 31, August 1, 2or 3? Scratch tickets will be added to orders that are placed starting on August 1st.